Feed cost represents approximately 40-70% of annual cow costs. Photo courtesy of USDA NRCS. On the whole, nowhere else in the United States has pasture costs on a cost per cow-calf pair per month basis as high as Nebraska. 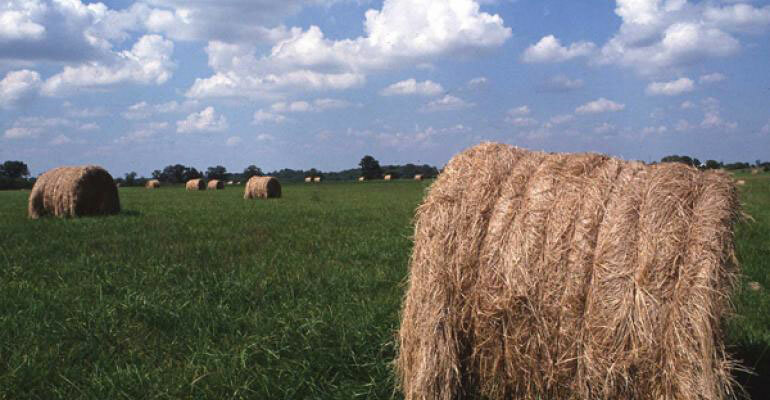 Summer pasture rental rate prices are driven in part by the abundance of cornstalks that provide a readily available economical winter feed source. There are approximately 10 million acres of corn grown in Nebraska each year compared to 2 million beef cows. Cornstalks are currently the most underutilized forage resource in many parts of the state. Feed costs in Nebraska are an interesting scenario depending upon what part of the state you live in. Cow-calf producers with access to cornstalk grazing often find that their wintering costs are significantly less per cow per month than their summer costs. Ethanol co-products such as distillers grains are a source of protein and energy that complement low quality feed stuffs such as cornstalks. On a price per unit of protein and energy, distillers grains often also one of the lowest cost feeds available. Taking time to calculate total annual feed costs can be a revealing experience. The total costs to feed a cow for a year and where those costs occur can provide information as to where changes could improve profitability. In evaluating feed costs, it is not only the cost of feed that is important, but also the cost of feeding, which includes labor and equipment expense in delivering the feed to the cows. A one page sample budget, Estimated Annual Cow Costs for Nebraska provides an example and a place to start to begin to calculate total costs for feed for the cow herd. Evaluating available feed resources, both grazed and harvested feed, in comparison to nutrition needs and demands of the cow herd throughout the year can indicate where opportunities are to make change. These changes might be as small as providing strategic protein supplement or as large as changing from a spring calving to a fall calving herd. Grazed and harvested feed costs are the number one expense for cow-calf producers. The Nebraska Extension Beef website has resources and contact information for Extension Educators and Specialists who can assist producers in evaluating feeding and management options. Knowing and evaluating annual feed costs can provide information that can help cow-calf producers improve profitability.